To Dog With Love: Pets Add Life: The joys of pet ownership and Cosmo Havanese! 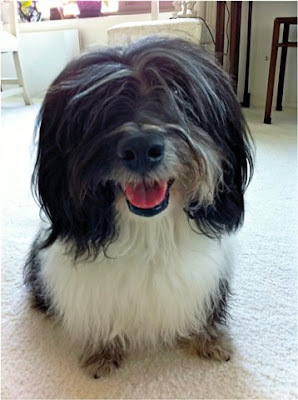 Pets Add Life: The joys of pet ownership and Cosmo Havanese! If you're reading this blog, then I probably don't need to convince you of the joys of pet ownership. But the way I figure it, with pets living in 62 percent of U.S. households* there's still plenty of room for more folks to experience the fluffier side of life. The folks behind the Pets Add Life (PAL) campaign seem to think so too. That's why they are all about sharing the joys of pet ownership ... especially responsible ownership and increasing the adoption of pets. So with that, I bring you the five most joyful things about living with Cosmo Havanese. Cosmo's fluffy, not stuffy, and he does something to make me smile every day! You can join the fun by posting a photo of your pet at the Pets Add Life Facebook page. You can post a video and share your favorite pet story too! And, let us know how your pet adds joy to your life! This post is sponsored by the Pets Add Life campaign and the American Pet Products Association. The Pets Add Life (PAL) campaign is designed to demonstrate the benefits of pet ownership, thus driving increased adoption of pets and responsible ownership of pets. I am being compensated for helping spread the word about the benefits and joys of pet ownership.